Hello! 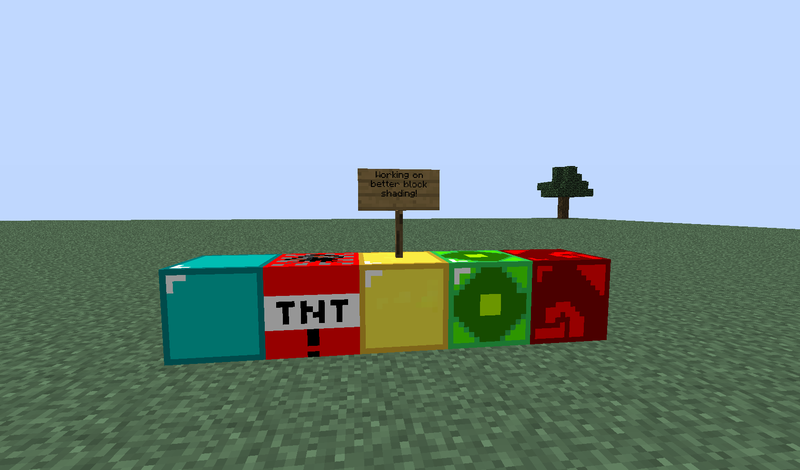 This is my first texture pack, so please tell me if anything need to be changed. Also, no adf.ly because I know you guys don't like it. Also, that emerald block is really cool. Remove the random black squares at the bottom of the TNT, it makes it look bad. Alright, I'm gonna edit more after school.I finished blockRedstone. I'll update the links, forum post, download, screenshots, etc after school. It's fine, and I really don't mean to put you down; but, there are a ton of simple packs, so you're going to have to compete if this is the style you want to make. Add some shading, just because it's simple doesn't mean it needs to look flat; you know? Keep going, it is the only way one gets better (practice makes perfect). Click it or it will die...A cold painful death. Simple packs have been done to death, we see countless of them posted every day and most of them are always bucket filled solid colored packs, something that anyone could throw together with little to no skill. These kind of packs are frowned on mostly due to how the forums keep getting flooded with them and for the fact that it don't take a brain to flat color a block and 'outline' it if even doing that. And a general rule is, is to just not bother posting such to the public. Very well made simple packs are very hard and rare to come by. I would really recommend taking a look at the Simple Pack Showdown where you can see many examples of what GOOD simple packs are like. Just because it is 'simple' don't mean it has to be flat colors. You may even want to try doing it yourself for fun, just because the contest is over, don't mean you can't give it a try, it could be a good learning experience and get you to try something you haven't done before and sort out new tricks. Taiine... how many of these do you have posted in a Notepad file?